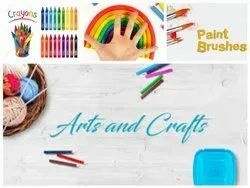 If you are an Enthusiast of DIY Projects around your home , we have an excluisve range of Art & Craft Supplies and Other Stationery at Reasonable Prices. We have a variety of products to choose from Under Student Coloursl like Wax Crayons , Oil Pastels , Plastic Crayons , Pencil Colors , Poster Colors , Acrylic Colors. We specialize in School Art & Craft Supplies and have all necessary materials for Art & art Related activities.